In a recent study by the Brookings Institute, they found that between 2000 and 2008, the percentage of American commuters who use public transit increased by 22.9% (30.8% in St. Louis!). The demand for public transit is rising, but the vast majority of people in this country and this region use single-occupancy vehicles to travel to work. But the rising costs of oil, public infrastructure, environmental impact and changing economic realities are starting to bring our reliance on the automobile into question. As we face a new century, with new challenges, how will we shape our transportation system, the circulatory system of our economy? Beyond the Motor City examines how Detroit, a grim symbol of America’s diminishing status in the world, may come to represent the future of transportation and progress in this country. The film explores Detroit’s historic investments in infrastructure—from early 19th-century canals to the urban freeways that gave The Motor City its name and made America’s transportation system the envy of the world. But it also reveals that over the last 30 years, much of the world has left Detroit—and America—behind, choosing faster, cleaner, more modern transportation. In a journey that takes us into the neighborhoods of Detroit and then beyond to Spain, California, and our nation’s capital, Beyond the Motor City urges us to ask how a symbol of America’s urban decay might transform itself into a model of urban revitalization. Can we finally push America’s transit system into the 21st century? Beyond the Motor City, directed by Aaron Woolf, is on a free screening tour to raise awareness about the future of transportation in the U.S. and the role of cities and consumers have in shaping that future. 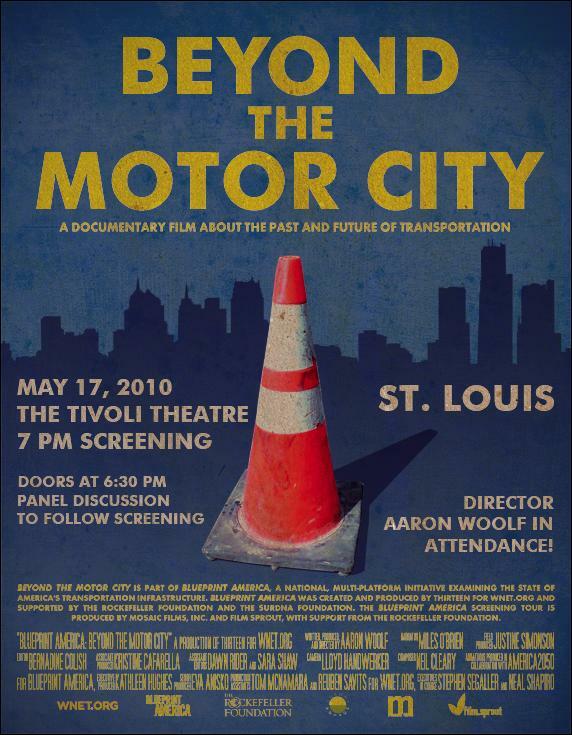 Beyond the Motor City will be shown in St. Louis on Monday, May 17, at 7 p.m. at the Tivoli Theater in the Delmar Loop. Immediately following the film, there will be a panel discussion moderated by KETC’s Patrick Murphy with Congressman Russ Carnahan, director Aaron Woolf, and Citizen for Modern Transit’s Tom Shrout. To RSVP for the event, visit CMT’s Facebook page. The Tivoli Theater is accessible by the Delmar and Skinker MetroLink trains, as well as the #97 Delmar and #1, #2, and Green Line MetroBus routes.